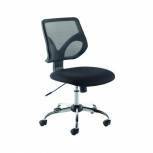 Jemini Tyne Mesh High Back Operator Chairs KF74501 Pack of 1 High back operator chair with a mesh back and adjustable seat height for comfort. Seat made from easy to clean leather look PU material. Knee tilt mechanism with tilt tension control. Suitable for 8 hour use. Maximum sitter weight up to 18 stone. Black. 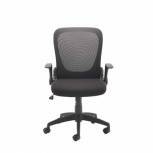 Arista Lexi High Back Chairs KF73906 Pack of 1 Arista Fusion High Back Mesh Chair With Lock and Tilt Black Recommended usage time 8 hours. Adjustable arms included. 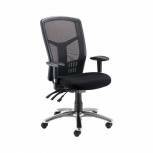 Avior Logan High Back Mesh Operator Chairs 09HD05 Pack of 1 Avior Logan High Back Operator Chair. Heavy duty seating especially designed for 24-hour use. Maximum sitter weight - up to 24 stone. Seat - W520xD480mm. Back - W500xH650mm. Seat height - 480-610mm. Colour - Black. Non returnable. 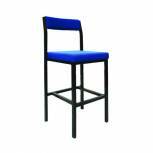 Jemini High Stool with Back Rest Blue PS4044 Pack of 1 Practical stool ideal for canteen, restaurants and work benches. 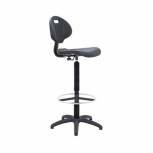 Manufactured from strong 1 inch square section steel with a black epoxy coating, foot bar and a comfortable upholstered seat and backrest. Colour - Blue. Non returnable. 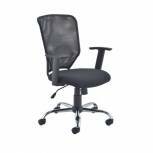 Jemini Nile Medium Back Task Chairs KF73602 Pack of 1 Jemini Medium Back Task Chair Black KF73602. Recommended usage time 5 hours. Seat dimensions: W465 x D465mm. Back dimensions: W465 x H380mm. Seat height: 455-535mm. Non returnable. 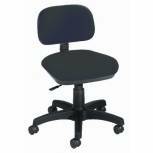 Jemini Draughtsman Chair Black KF017052 Pack of 1 Draughtsman Chair in soft, easy wipe polyurethane. Gas seat height adjustment. Ideal for warehouses, factories, labs and more. Seat dimensions W470 x D435 x H690 - 810mm. Black. Non returnable. 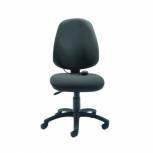 Jemini Sheaf Medium Back Operator Chairs CH0S13CH Pack of 1 Jemini Medium Back Operator Chair. 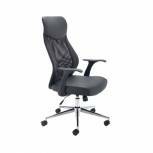 Quality operator chair with generous waterfall front seat, deep foam seat and back cushions, gas height adjustment and five star castor base. Colour - Charcoal. Optional arms available. Non returnable. 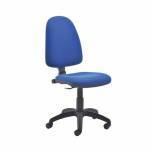 Jemini Sheaf High Back Operator Chairs CH0S02RB Pack of 1 Jemini High Back Operators Chair. Colour: Royal Blue. 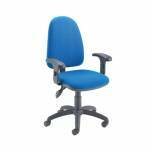 Jemini Gas Lift Typist Chair Blue KF50204 Pack of 1 Jemini Gas Lift Typist Chair with recommended usage time of 5 hours and a maximum sitter weight of 16 stone. Dimensions: seat W460 x D445mm, back W390 x H340mm, seat height 480 - 570mm. Colour - Blue. Non returnable. 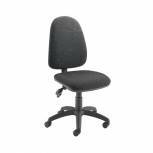 Jemini Rhine Soho Chair KF74823 Pack of 1 FF Jemini Soho Chair Black KF74823 Non-Returnable Unless Faulty. 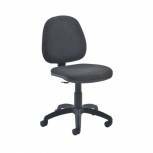 Jemini Gas Lift Typist Chair Charcoal KF50205 Pack of 1 Jemini Gas Lift Typist Chair with recommended usage time of 5 hours and a maximum sitter weight of 16 stone. Dimensions: seat W460 x D445mm, back W390 x H340mm, seat height 480 - 570mm. Colour - Charcoal. Non returnable. Jemini Sheaf High Back Operator Chairs CH0S02CL Pack of 1 Quality operator chair with waterfall front seat and five star castor base. Colour - Claret. Optional arms available. Non returnable. 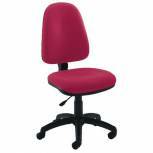 Jemini Sheaf High Back Tilt Operator Chairs CH0S10CH Pack of 1 Jemini High Back Tilt Operator Chair. 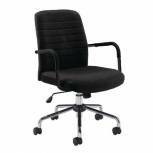 Quality operator chair with deep padded seat and back rest, waterfall seat, asynchro tilt mechanism, back tilt and robust five star castor base. Colour - Charcoal. Optional arms available. Non returnable. Jemini Sheaf High Back Tilt Operator Chairs CH0S10CL Pack of 1 Jemini High Back Tilt Operator Chair. 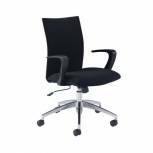 Quality operator chair with deep padded seat and back rest, waterfall seat, asynchro tilt mechanism, back tilt and robust five star castor base. Colour - Claret. Optional arms available. Non returnable. Jemini Sheaf High Back Tilt Operator Chairs CH0S10RB Pack of 1 Jemini High Back Tilt Operator Chair. 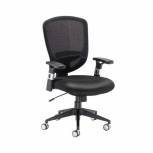 Quality operator chair with deep padded seat and back rest, waterfall seat, asynchro tilt mechanism, back tilt and robust five star castor base. Colour - Blue. Optional arms available. Non returnable.